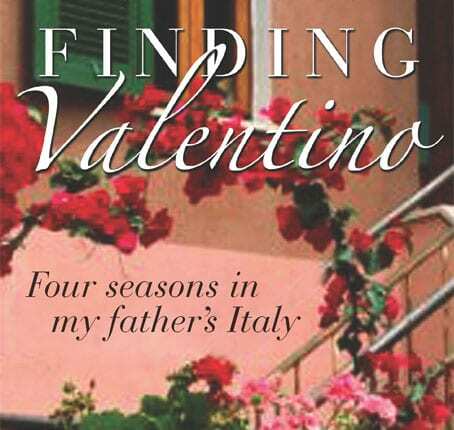 Finding Valentino is the autobiographical story of a daughter returning to Abruzzo from Australia to discover her father’s past. 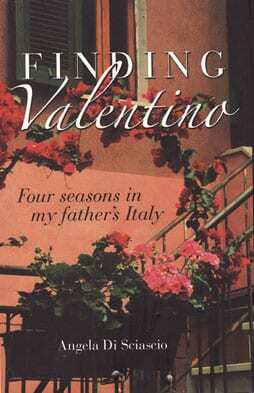 He is suffering from Alzheimer’s and following his announcement that he dislikes being called Wally, his ‘Australian’ name, that he always preferred Tino from his given name Valentino, she realises how little she knows about this man, his youth and her heritage in Abruzzo. As Wally/Tino’s world decreases to playing the accordion, a memento of another age, character & continent and he starts speaking more Italian than English, Angela decides to travel to Abruzzo to learn more about her father and his land. Whilst there she learns to cooks Abruzzo-style with her Aunts, and experiences first hand her the mother tongue of her father, and the richness of the dialect he grew up with. Angela spends four seasons with her father’s youngest brother in the house where Valentino was born, in the small hill village of Capoposta, twelve houses that sit just outside Casoli in Chieti under the majesty of the Majella. She breaks up her time here with travels around Italy. It made me laugh how she became “the girl that was stared at” when setting out to walk off the girth of her Aunt’s cooking. I too used to feel that when out walking our dog before later stares became beams and a big wave from a speeding Fiat Panda. I was never sure if those stares were that I walked our dog, (nobody just dog walks, it’s always combined with the slightly more social La Passeggiata) or that my ever busy neighbours thought it a decadent excursion, mad girl out with her camera again doesn’t she ever work! I loved Angela’s tight descriptions, “squeaky cheese” –one that is fresh, sliced and fried rather like halloumi which, unless you stay with locals, is a delight that will probably pass you by. It’s become a firm favourite of ours too and I whoop when our Cheese Man in his van has some. She visits Grotto Cavallone which you can visit using a tiny cage like basket to get up to. I was so pleased to read that she preferred the precarious 4-wheel drive to get there – no longer did I feel alone from refusing to go up in those cages! How well anyone who knows Abruzzo, away from its cities and towns, will recognise her phrase “Everywhere there is a silence and calm”; it’s these qualities that are quite addictive, small wonder that so many Romans and foreigners have a bolt hole in Abruzzo to rediscover this within themselves. It’s the perfect book for those thinking of going back to visit their Abruzzo roots. You can try out the recipes that interlace the book from the region and if going for a time, wonder if you could survive on just eating Abruzzese? Angela herself develops a home sickness for cuisine that isn’t Italian. If you are thinking of living here that is something to bear in mind; if you like Indian, Thai, Spanish and Mexican then those dishes are going to be something you need to learn to make yourself as you will only get to eat them at home. The thought of how little we know about our parents’ lives before we arrive on the scene pin-picks one throughout the book; make time to chat now was my last thought on closing the last page, it’s great to read a book with a subconscious moral to take into your own life.